Giant bamboo is truly a remarkable sight. 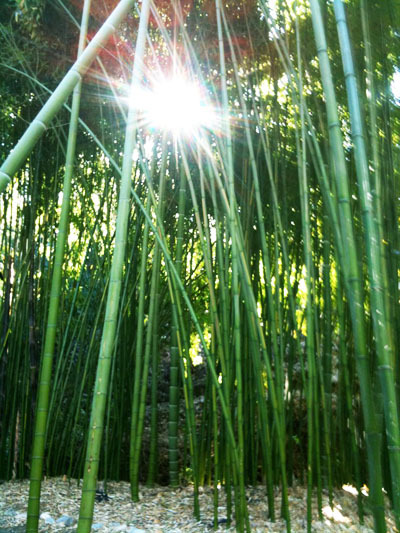 The culms or stems of bamboo can grow to heights in excess of 100 feet and 7 inches in girth. Some of the most common giant bamboo varieties include Japanese Timber (Phyllostachys bambusoides), Moso Bamboo, Chinese Timber. Botanical gardens throughout the world have utilized giant bamboo to create amazing natural spectacles with these giant grasses. In fact, it is easy enough to create a giant bamboo garden on your own property in a relatively short period of time. 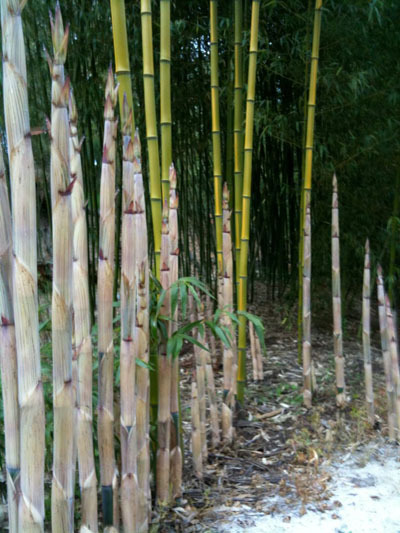 Growing the correct bamboo plant species can yield massive plants in just a few short years. What’s ever more remarkable is the growth rate of giant bamboo. Some of the fasting growing varieties can grow 40 inches in a single 24 hour period! The bamboo cane will reach its full height in a single season, which is typically no more than 4 months. In the spring, the bamboo shoot will start to emerge from the soil. Bamboo shoots are very soft and usually brown, yellow, purple or reddish in color. The culm is protected by a sheath that will eventually shed off as the plant grows taller. Giant bamboo shoots are noted for their culinary uses and are common in many Asian dishes. Giant Bamboo species are available from a wide range of bamboo suppliers, both locally and online. Giant bamboo can take a few years to establish in your area, so give it time before you expect it to produce massive bamboo canes. Check out our suppliers database to find a bamboo supplier in your area. Giant bamboo has a number of practical applications. It has been used for centuries in Asian nations for construction purposes. Today, bamboo is becoming increasingly common in the United States because of its reputation as a sustainable resource. A bamboo grove will produce 4 times more biomass than traditional pine forests. This fact makes giant bamboo an ideal resource for controlling carbon emissions and replanting demolished forests. Bamboo is also a versatile resource and can be used to create plywood, flooring, blinds, and many other popular products. In Asia, giant bamboo has been used to construct small bridges and scaffolding. It is still common today to see bamboo scaffolding employed in China’s many construction projects. In addition, bamboo has been used to accent many homes in Asia. Click here to learn more about giant bamboo.